When we were first experimenting with flavors for our chocolates, we agreed that to make extraordinary chocolates, we needed to source our flavors from extraordinary people. At that time Kira had been working with a group at the University of Pennsylvania that was spending time in public schools setting up nutrition programs. One of their new efforts was a student run garden at Drew Elementary and UC High School in Philadelphia. We agreed that we needed to incorporate the kids into the new product line, and what better ingredient for the students to grow than mint! After consulting with the new student gardeners, we settled on a patch of Kentucky Colonel mint, grown and tended caringly by the kids and sold to us every week. We arranged a courier to make weekly pickups, and the partnership was born. The mint was housed in the students' greenhouse, extending the growing season and allowing them to produce higher quality mint in larger quantities. When we began to use more product than these students could feasibly produce, we added partnerships with more gardens to our expanding student herb project. Drew Elementary and UC High School have since closed, and the garden where all this began is no longer a cultivated and cared for patch of soil, but our partnership with various urban gardens in Philadelphia and elsewhere continues. Each garden that we partner with harvests some combination of mint,rosemary, chili peppers, lavender, or other herbs for us that we use to flavor our Urban Garden Bars. 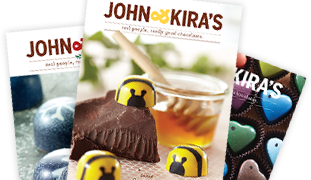 We share the story of the gardens on the chocolate bar packaging, on our website, and in our catalog. We supply the plants, buy what is harvested, and also give 5% of all bar sales back to the gardens. We also sponsor fundraisers and awareness campaigns and other activities throughout the year to show our support. These projects fit perfectly with our mission & philosophy: ethical sourcing and innovative design to make the best chocolate with the best people. It is our hope that the taste of these bars will pique interest in the school garden movement and ultimately motivate people to support similar local projects. This area of our website is currently under construction as we update information and add new Partners. Stay tuned for exciting updates to this program in the coming year! Meet Our Urban Garden Partners - UNDER CONSTRUCTION - Check back soon! 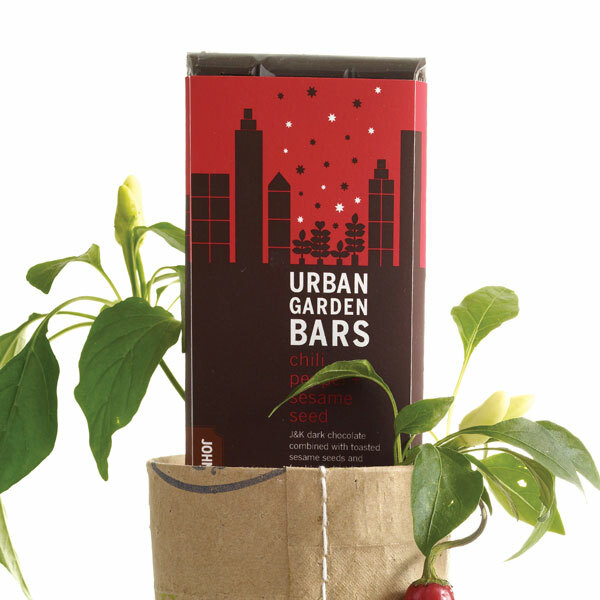 We now make three Urban Garden Bars featuring ingredients from urban gardens. 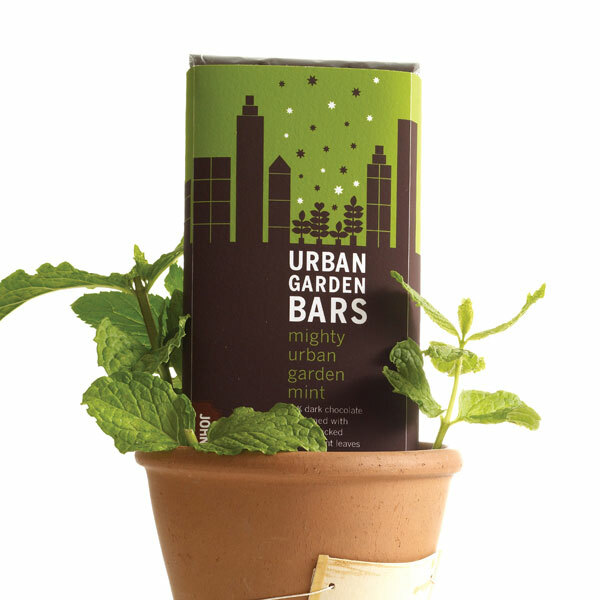 Our Mighty Mint, Tangy Orange + Garden Rosemary, and Chili Pepper + Almond Urban Garden Chocolate Bars highlight fresh mint, rosemary, and guajillo peppers from urban gardens in Philadelphia and Washington, DC. Five percent (5%) of the sale price of bars goes directly back to the gardens to support the educational programs the gardens provide to inner city youth. For the Mighty Mint bar (which happens to be vegan), the fresh mint leaves are steeped directly into 62% dark chocolate for an amazingly refreshing flavor that tastes just like mint picked from your Grandmother's garden. 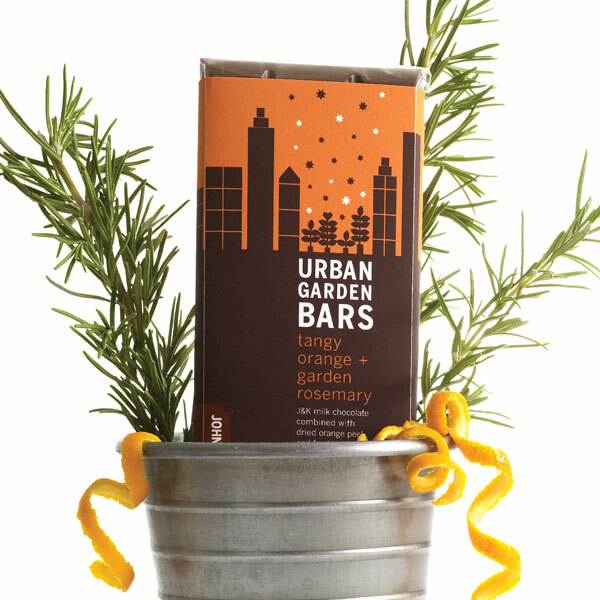 For the Tangy Orange + Garden Rosemary bar, the fresh rosemary is steeped directly into 40% milk chocolate for a delicious and unique flavor that tastes exactly like rosemary picked from a garden. For the Chili Pepper + Almond bar, 62% dark chocolate is combined with almonds and directly infused with fresh guajillo chilies for a delicious and unique flavor that tastes exactly like freshly picked chili peppers.